If one day I happen to get a racehorse, definitely his name would be Fever or Shooting Magma, but probably Fever because I absolutely love the song by Adam Lambert. It's one of my favorites. 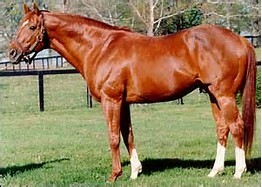 Fever would be bright red, with 3 white legs, and of course he would WIN the Triple Crown. He would be different from the other race horses--instead of a plain halter or saddle blanket, he would have a glittery red and white one and a beautiful braid down his tail. He would be beautiful, unique and different. He would be fast but not too terribly fast at the first part of the Kentucky Derby. He would hold back, well at least the jockey would, and at the Preakness Stakes he would do the same. Only, he would climb faster to the lead. And finally 3 weeks later, the Belmont stakes--the last race, the longest race in history (I think, LOL), he would be excited but terrified at the same time. He will want to win just as bad as the jockey does, to run and finally stretch his wings over the race track in New York City. The trumpets will sound and his legs will shake. He will want to get out of those gates so bad. And finally, when the gates break, he would take the lead. I will have sworn he has wings and his hooves smoke over the track. He will fight to the lead, with me out in the crowd sweating bullets, so scared that his career as a racehorse would end today with a bad fall. But I will be lucky, he is already going around turn two, the home run, the longest part of the race the stretch, with the other horses fighting for the lead. But that won't stop old Fever. He will want that pride of being the Triple Crown Winner and will cross the finish line. The crowd will go wild as the jockey does a 3 pumped fist and Fever poses and trots to the winning circle. In his eyes, you will see he is proud, happy, and if you look really close you will see all the famous racehorse spirits encircling him. The beautiful roses will be his to keep. He knew he could do it and that is why he didn't stop. And in that night, as everyone celebrates, I will walk out to the barn, say hi to Fever and rub his head dearly as he whinnies the echo of a champion, far and out of the stable. He is a winner, a real winner. After the winning the Triple Crown, he will retire and live the rest of his life in a big field. And like all other famous racehorses, he will become history after her passes away in the year 2027. And in that same year, another beautiful bright red colt will be born--his son. And in the colt's eyes you would see the same spark that kept Fever going. He will have what his father had--the winning streak, and his name will be Sure Fire Winner. And Yes, he will be a winner. He will win the Triple Crown like his father did. I hope I could live this someday. By the way, tell me if it's good or bad? Thanks. I hope your dream comes true!!! Good luck! Please keep your eye out for the story of Sure Fire Winner, and comment! I'm actually thinking about writing about the son, and see how things go since this one's a favorite to me and others.... I really enjoy all the comments. Thanks y'all! I agree with Devyn - well-written. Enjoyed it and even though my dreams of equestrian competition are a little different, I can appreciate it! Certainly you can order a few "steaks" for lunch at the Belmont Park restaurant, but the Belmont "Stakes" (the Preakness Stakes, too) are races where the prize money is partly funded by the entry fees (stakes) that the horses' owners have to pay. Thank you for the comments, I really appreciate it!! !